I just love agility. Riley loves lure coursing, cats, goats, birds, chickens… you get the picture. So that means with Shih Tzu agility training comes frustration in my house or should I say my backyard and on the agility field. Granted I am fully aware that Riley is not a border collie or Aussie… and that is fine. 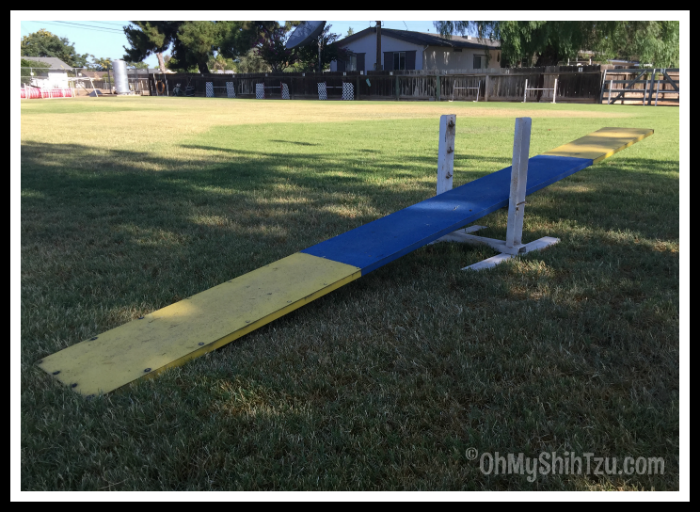 From the beginning I always said that I chose to do agility with Riley because she is a Shih Tzu and with that it can be a little more challenging. I embraced the challenge… but there are times it can be so frustrating. Yes, like I said Riley loves all sorts of animals and these can be huge distractions. And when she doesn’t want to listen to me, well she just doesn’t. It seems the older she gets the more stubborn she gets. See what I mean? She doesn’t listen to me… and if you were wondering about the sheep I keep referring to in the video. Yeah… nope they are goats I do know the difference but for some reason I kept calling them sheep! Now I will admit that I have steered clear of this obstacle at times… working more on our jumps and serpentines, weaves, tunnels, etc. But for the past couple of months now I have really given it my all in trying to get her over her fear, which I find completely odd. Because it’s not completely the whole movement of the teeter, as she works out with balance tools such as the FitPaws Donut… it’s the whole thing of the teeter dropping down from underneath her that freaks her out. And as a pet parent with an extreme fear of heights I can totally understand. If you can tell in the video, I started to get frustrated at her. This is the point when we just have to forget about everything we are doing and just play and have fun for a while and move on to another obstacle. Agility is supposed to be fun for both of us and I think that is one of the most important things to remember. I want her to love agility as much as she loves lure coursing, at least that is my dream anyway. But even if she never loves it as much as I do, I always want to make sure she is having fun. In actuality, days are not as bad as this day… yes this all happened the same morning. I am optimistic that today’s agility session will be smooth as silk. We will be doing a few jumping patterns, throw in some weaves along with hitting the teeter for a couple of rounds. We throw in a few cardio sessions with my trusty 12 foot whip! No it’s not what you think… I tie a white plastic bag on the end and Riley chases it around and around!! Today we are joining FitDog Friday hosted by our friends Slimdoggy, To Dog with Love and My GBGV Life. Yep, it’s the thing to do…have fun…My Human does that too; some days all I want to do is play. I let the Human know, so we just play instead of run drills, or practice rally obedience. The people who manage our raw food co-op are holding a picnic and we’re going to take the puppies. The couple is also very into agility so we’ll be able to chekc out their equipment. Yayyy! The thing about agility, or any dog activity, is the more the BOTH of you enjoy it, the better it is. I can be just the same sometimes. I know Earl can go amazingly well, but he’s not the fastest dog on the planet at times, and it depends on his mood that day (and mainly my mood!!!) whether he wants to do it or not! Mine aren’t Border Collies or Aussies either, but we enjoy our sport, and are continuously working on our faults, and getting Earl to have fun, because sometimes, he isn’t in it. Ethel is a lot more energetic however!! Don’t worry Kilo would have wanted to eat the goats or just nap in the grass. Too funny – she has no interest in anything but the goats…and they are probably out there all the time! Makes for a real training challenge – good luck! Slimdoggy recently posted…Are Show Dogs Fat? My mom has the same problem with our sports. She wants us to do so well, to get titles, and she knows we can do it, but when we aren’t doing it as well as we can, she gets frustrated and it is hard for her to switch to just having fun. The main thing is being together as a human dog team. Practice makes perfect, and some dogs like some sports more than others. Bailie and I both do tracking and nose work, but I love nose work and Bailie loves tracking and it can be seen in how we perform. Mom accepts it and just works with us as best as she can knowing what we really enjoy the most.